UPDATE: The research below exposed a possible new way of synthesizing EdenCrete from in situ resources -- one that bypasses the Calera process hence obviates the chlorine disposal problem. It may also reduce the energy per mass. This would reduce the reduce the doubling time and simplify the process. A future article will discuss the implications. For now, this article remains the best approach to balancing the geochemistry of the reference proposal. The greatest challenge of the proposed "Exponential Remediation of Civilization's Footprint" is the necessary sequestration of chlorine evolved during the production of concrete, from oceanic salt ions (Ca++, Na+, Cl- and CO3--), for 70,000 Bowery Atolls. The cited Calera process concrete produces 71% of its weight in chlorine (see "Comparison With Land Based Geologic Sequestration of CO2" below) while sequestering CO2 in the atoll concrete. Later, we'll compare the magnitude of chlorine to the magnitude of land-based geologic sequestration of CO2, which can support many times the CO2 projected to be sequestered in the Bowery Atolls. But that requires transportation of evolved chlorine to those sites. So first, we'll look at the in situ potential for geologic sequestration. In situ resource utilization is highly desirable in an exponentially growing system. The civil engineering sense of "in situ" is applicable: "construction which is carried out at the building site using raw materials... which are present at or near a project site". In situ resources obviate their transportation cost which, in exponential growth, can represent a severe constraint. In the present case, resources include not only those that go into the atoll concrete, but also the resources to dispose of waste: geologic formations under the tropical doldrums suitable for chlorine sequestration. 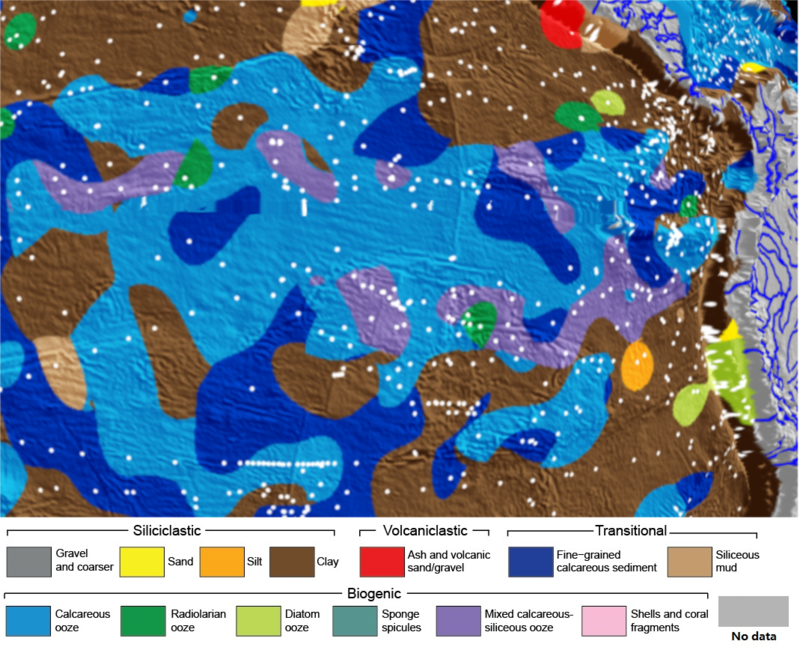 Look at this map of deep sea marine sediments. Map showing distribution of marine sediments. White: Sediments of the continental margin. Notice the eastern equatorial Pacific (doldrums) sediments are yellow, with green just to the north. Underlying the construction site are "siliceous" and "calcareous" sediments. There are sand (very fine grained, suitable for EveCrete binding) and calcium carbonate sediments, respectively, available in situ. Chlorine sequestration is thereby turned into H2CO3 (carbonic acid) sequestration, 1000ft beneath the already several-kilometer deep ocean floor. The H2CO3 will act as a connate fluid that is gradually expressed from the sediment, upward toward the ocean floor 1000ft above, over geologic time during lithification: the process turning sediments to sedimentary rock. Unlike water, the usual connate fluid, this particular connate fluid chemically interacts with the CaCO3 sediments via carbonate buffering. This provides additional environmental protections in the form of pH stabilization and slowing of the already geologic time rate of reentry to the biosphere. Is There Enough Sediment To Contain All That H2CO3? The volume of in situ calcareous sediments is on the order of 10,000 times greater than the volume of H2CO3 evolved which is comparable to the volume of Cl2 evolved from the 70,000 Bowery Atolls. If only 1% of that volume is utilized for geologic sequestration, the volumetric concentration would still be only 1% of that reduced volume. How Costly Is the Geologic Sequestration? Existing deep sea drilling technology suffices as an economic existence proof. A deep sea drilling platform costs about 10% of the net present value of an atoll. Even if each atoll requires its own drilling platform, this is not blocking. If chlorine is delivered to the sediment, liquid chlorine density of 1.5625gm/ml will provide about 15,000psi over-pressure at the ocean floor due to its higher density than water. This is within the engineering limits of deep sea drilling. Going 1000ft deep into CaCO3 sediments will subtract little from that injection pressure. The compressive strength of concrete is only about 5,000psi so even if the CaCO3 is in the form of concrete, the injection pressure at that depth will fracture the sediments, permitting the ingress of liquid chlorine. It is this HCl that will participate in the reaction already described that produces H2CO3. Land-based geologic sequestration capacity is known to be vastly greater than that required for sequestering the CO2 sequestered by 70,000 Bowery Atolls. As it turns out, the liquid volume of CO2 sequestered in the concrete of the artificial atolls is significantly greater than the liquid volume of Cl2 produced. Total CaCO3 mass of atolls. Total C mass of atolls. Total Ca mass of atolls. Total Ca mass in the entire ocean. Total Cl2 mass evolved during atoll construction from Calera process. Total CO2 mass sequestered during atoll construction from Calera process. Whenever you find yourself outraged by a story and want to comment about it, include a link to this article as an action-step people can take. Watch The Army amass here for Bitcoin plus here for Ethereum. The number of such transactions measures the mass of The Army. Read the following justification for this non-negligible monthly sacrifice. About 1 in 3 Americans believe that civil war will breakout in the near future. Individuals are increasingly vulnerable to mobs, particularly as mobs capture American institutions established to protect the individual from mobs. Individuals, powerless against and fearful of the growing power and virulence of mobs, seek safety in numbers by joining mobs. First we must answer the question, "What happened?" Next we must answer the question, "How can individuals protect themselves against institutionalize mobs?" Centralization of power forces everyone, as a matter of self defense, to vie for the center of power. This encourages mob mentality. The centralization of power in America has gradually empowered mobs of all stripes. The fatal blow was the The Immigration and Nationality Act of 1965 steadily increasing immigration decade after decade -- a policy overwhelmingly opposed by Americans. Why was this the fatal blow against the individual? Because about 80% of naturalized citizens vote for greater centralization of social policy in the Federal government. Act together or act individually and hang individually. First and foremost, this means synchronized action. Think about the public "shutting down the Congressional switchboard" in response to mass media inspired outrage. Any synchronized action is vastly more effective than asynchronous action because of the effects of transients on networks upon which civilization depends. Start small and symbolic but synchronized. This will build a pattern of victory. 12PM Central Time of the 30th of each month. To permit a one month cycle for the OODA loop: Observe, Orient, Decide, Act. This is a general "loop" utilized in litigation, business, law enforcement and military strategy. What Action To Start With? Will be visible to all other actors so that people can measure their force level: a quorum sensor. Mob institutions cannot trace back to individuals who are fearful of reprisal. Mob institutions will have difficulty subverting with "sock puppets" (mounting a "Sybil Attack"). Anyone anywhere can do at the agreed-upon instant without overloading the quorum sensor. Will, prior to any violence or even illegal actions by individuals, convince the mob institutions to "stand down" and decentralize power. What Could Possibly Fulfill All Those Requirements? Why Should I Send My Money To Those Addresses? So that when others look at the public blockchain for those addresses, they can see how many people have bothered to act at that instant in time. The real purpose of the "non-negligible" amount of money is to convince all observers, allies and adversaries, of the seriousness of the amassing army. What Is That Money Going To Be Used For? Decreasing the size of the executable archive of a broad range of longitudinal social measures. Is This Of Any Relevance To The Amassing Army? Well, yes, but it is esoteric enough that The Army will not likely understand its relevance. The important thing, as just pointed out, is the sacrificial nature of the money. However, the esoteric forces arrayed to centralize social policy, if they understand it, will realize Ockham's Guillotine leads to a provably unbiased AI that speaks the truth about social causation. This they will find terrifying in proportion to the size of the prize fund -- terrifying enough that they will most definitely not want to contribute. This means that the forces of centralization, with sufficient resources to hire analysts, will self-exclude from the signal sent on the 30th. The signal sent on the 30th will not be subverted by deep-pockets spoofing non-existent mass. income_tax_rate = the aggregate tax rate on economic activities, such as income, capital gains, value added, etc. The more negative this difference goes, the greater the expropriation of liquid value. It is important to note that the above formula assumes the buyer does not enjoy a standard deduction -- for example a homestead deduction as normally protected under Chapter 7 bankruptcy. Such a deduction is an ordinary feature of wealth tax proposals and would frequently come into play in a change to single tax on wealth as tenants purchase their residences from landlords. You have been taught that nationalism is the primary source of "genocide" -- that nationalists perpetrate "genocide" and that ridding the world of nationalism is an important, perhaps the most important step in eradicating the threat of "genocide". You have been taught, and are now a believer in, the exact opposite of the truth. Raphael Lemkin and his work with the Geneva Conventions led the term "genocide" to be incorporated into the Geneva Conventions. "Generally speaking, genocide does not necessarily mean the immediate destruction of a nation, except when accomplished by mass killings of all members of a nation. It is intended rather to signify a coordinated plan of different actions aiming at the destruction of essential foundations of the life of national groups, with the aim of annihilating the groups themselves. The objectives of such a plan would be the disintegration of the political and social institutions, of culture, language, national feelings, religion, and the economic existence of national groups, and the destruction of the personal security, liberty, health, dignity, and even the lives of the individuals belonging to such groups. Genocide is directed against the national group as an entity, and the actions involved are directed against individuals, not in their individual capacity but as members of a national group." Cited in "Beyond the 1948 Convention -- Emerging principles of Genocide in Customary International Law," Maryland Journal of International Law and Trade, vol. 17, no. 2, Fall 1993, ppp. 193-226. "Genocide can be eradicated by eradicating nationalism." are actually perpetrators of genocide under its proper definition within the Geneva Conventions. Furthermore, since the pervasive teaching of this ideology has been the primary moral force for the disintegration of, not one, but most national identities during the last half of the 20th century, its teachers have been and are by definition the primary perpetrators of genocide over the last half century. The primary Individual Right, that to vote with one's feet, being inconsistent with prisons, necessitates replacement of involuntary incarceration with involuntary border-enforced exile and allowing a State to preemptively exclude anyone for any reason whatsoever deemed appropriate by that State. This, in turn, necessitates a State of Nature to which Individuals are always admitted, even if they are excluded from all other States. The material Individual Implied Right to land is realized by providing each Individual with a non-monetary rent stream, equal to all other Individuals, assigned to that Individual's State, for competitive reapportionment of State territories according to the census of its residents and the value those States place on land. The objective condition fulfilling the Individual Implied Right to transportation is that the Individual's current State of residence must, on demand, provide safe transportation to its border. The borders of adjacent States must therefore provide neutral zones through which migrants may pass unimpeded. Any other material assistance that Individuals may provide to migrants is entirely voluntary. States enclosing other States as enclaves must provide some means of escape, even if only a neutral zone that extends through its territory to the enclave. Guilt for breaking any point of these laws shall be determined according to Item 3 above. The invariable penalty for anyone found so-guilty shall be death within twenty-four hours. 1The language for the The State of Nature is derived from p90-93, “Valoric Fire And a Working Plan for Individual Sovereignty” From the Valorian Society ISBN 0-914752-18-9, except for the underlined additions set forth in above. For definition of terms such as "sovereign" and "shielded" as well as further explanation, see introductory text in Sortocracy's "The State of Nature". I am James Bowery, Chairman of the Coalition for Science and Commerce. We greatly appreciate the opportunity to address the subcommittee on the critical and historic topic of commercial incentives to open the space frontier. The Coalition for Science and Commerce is a grassroots network of citizen activists supporting greater public funding for diversified scientific research and greater private funding for proprietary technology and services. We believe these are mutually reinforcing policies which have been violated to the detriment of civilization. We believe in the constitutional provision of patents of invention and that the principles of free enterprise pertain to intellectual property. We therefore see technology development as a private sector responsibility. We also recognize that scientific knowledge is our common heritage and is therefore a proper function of government. We oppose government programs that remove procurement authority from scientists, supposedly in service of them. Rather we support the inclusion, on a per-grant basis, of all funding needed to purchase the use of needed goods and services, thereby creating a scientist-driven market for commercial high technology and services. We also oppose government subsidy of technology development. Rather we support legislation and policies that motivate the intelligent investment of private risk capital in the creation of commercially viable intellectual property. In 1990, after a 3 year effort with Congressman Ron Packard (CA) and a bipartisan team of Congressional leaders, we succeeded in passing the Launch Services Purchase Act of 1990, a law which requires NASA to procure launch services in a commercially reasonable manner from the private sector. The lobbying effort for this legislation came totally from taxpaying citizens acting in their home districts without a direct financial stake -- the kind of political action intended by our country's founders, but now rarely seen in America. We ask citizens who work with us for the most valuable thing they can contribute: The voluntary and targeted investment of time, energy and resources in specific issues and positions which they support as taxpaying citizens of the United States. There is no collective action, no slush-fund and no bureaucracy within the Coalition: Only citizens encouraging each other to make the necessary sacrifices to participate in the political process, which is their birthright and duty as Americans. We are working to give interested taxpayers a voice that can be heard above the din of lobbyists who seek ever increasing government funding for their clients. Americans need a frontier, not a program. Incentives open frontiers, not plans. If this Subcommittee hears no other message through the barrage of studies, projections and policy recommendations, it must hear this message. A reformed space policy focused on opening the space frontier through commercial incentives will make all the difference to our future as a world, a nation and as individuals. When Neil Armstrong stepped foot on the moon, we won the "space race" against the Soviets and entered two decades of diminished expectations. The Apollo program elicited something deep within Americans. Something almost primal. Apollo was President Kennedy's "New Frontier." But when Americans found it was terminated as nothing more than a Cold War contest, we felt betrayed in ways we are still unable to articulate -- betrayed right down to our pioneering souls. The result is that Americans will never again truly believe in government space programs and plans. Without a frontier, for the past two decades, Americans have operated under the inevitable conclusion that land, raw materials and wealth itself are fundamentally limited and therefore to be hoarded and controlled -- rather than created. Out of this post-Apollo mentality, a deeply rooted cynicism has led young people into careers as lawyers and financial manipulators rather than farmers, inventors and engineers. It has led to an environmental movement which loathes humanity's natural capacity to transform hostile environments with technology. It has led to cartels, wars over energy and a devastatingly expensive arms race. It has led businesses and investors to remain averse to high risk technology development even as they issue billions in high risk debt vehicles for corporate take-overs. It has led to a preference for real estate speculation over job creating investments, making it nearly impossible for most of those born in the mid-to-late baby boom of the 1950s to establish stable careers, homesteads and equity for retirement, even with two incomes. In short, the lack of a frontier is leading us away from the progressive values of the Age of Enlightenment, upon which our country was founded, and back to the stagnant feudalistic values of the middle ages. We look to the Japanese for cultural leadership. We forget the rule of law and submit to the rule of bureaucracy, both corporate and governmental; for in a world without frontiers, the future belongs to the bureaucrat, not the pioneer. No where is this failure of vision more apparent than in our space program where the laws of human nature and politics have overcome the laws of nature and the space frontier as in "Take off your engineering hat and put on your management hat." First Apollo failed us. Then the shuttle raised and dashed our hopes by failing to provide easy access to space. We now look forward to the proposed space station as the last vestige of a dying dream written of by Werner Von Braun in Collier's magazine during the 1950's, even as its costs skyrocket and its capabilities dwindle into a symbolic gesture of lost greatness. The pioneering of frontiers is antithetical to bureaucracy and politics. The greatest incentive for opening frontiers is to escape from calcifying institutions. We betray our deepest values when we give ownership of our only frontier to such institutions. Therefore, these hearings on incentives to open the space frontier are among the most hopeful events in recent history. Those responsible for holding these hearings and acting to create pioneering incentives to finally open the space frontier, are to be commended for their insight, courage and leadership. They are earning for themselves and our entire civilization a place of honor in history. Over the past few years the Coalition has worked with Congressman Ron Packard and a broad spectrum of other Congressional leaders to introduce and pass a bill providing the most significant incentive for opening the space frontier to date: The Launch Services Purchase Act of 1990. Similar to the Kelly Act of 1925, which created incentives for pioneering aviation, the LSPA seeks to synthesize a commercially reasonable market from existing government demand for launch services. Lowering the cost of access to space through incentives for commercial competition is the most important goal in our space policy because launch costs dominate all others. Although extensively amended from its original language, the LSPA remains a symbol of pioneering spirit, democracy in action and American values in the one place it counts the most: The Space Frontier. Congressman Bob Walker's Omnibus Space Commercialization Act of 1991 contains two important provisions which will expand and empower the incentives of the LSPA. The first provision is the return of language in the LSPA to cover the Department of Defense as well as NASA, and to cover all space transportation, not just orbital launch. The second is the substantial funding authorization for launch and payload integration service vouchers under the Department of Transportation. The independence of the Department of Transportation's Office of Commercial Space Transportation creates exactly the kind of checks needed to avoid conflicts of interest. Private investors can trust their capital with such carefully constructed incentives. Another important provision of the Omnibus Space Commercialization Act is the encouragement of many Federal agencies to participate in space activities. Such variety of funding sources further inhibits the politicization of space by replacing political competition for centralized programmatic control with incentives for performance in technical and commercial competition. These incentives are helping to open the space frontier because they discriminate on the basis of actual achievement rather than political savvy and psychological appeal. By acting as a market instead of a monopsony or as a source of capital, government funding ceases to control or compete with the initiatives of our citizenry. Instead government rewards viable citizen initiatives with the profits needed to further capitalize space services, while punishing failed management and technology with bankruptcy; conditions virtually impossible to replicate within the space paradigm of the past. Profit and bankruptcy are as essential to technical progress as mutation and selection are to biological evolution. They are the "invisible hand" that guide private investors to create viable solutions to our needs. Just as mutation and selection led life from water onto dry land, so profit and bankruptcy will remove the earthly limits on life and open to life the limitless ecological range of space. Distribution of funding in peer-reviewed grants to scientists which patronize commercially competitive companies not only utilizes market forces to optimize infrastructure design and operations, but it also spreads space dollars out to all Congressional districts without multi-year authorizations, technical prejudice or political gamesmanship. This apolitical cashflow creates commercial incentives and it builds solid justifications for the use of our space dollars with a hard-core nation-wide constituency. But robust justifications and hard-core political constituency pale in significance when compared the explosive energy of Americans challenged by the incentives and freedoms of a frontier. Distribute space funding to multiple independent agencies for the funding of unsolicited scientific proposals. Require that the experiments be designed to fly on existing commercial services. Expose the proposals to review by a patent examiner to ensure the work is genuine science, as defined under intellectual property laws, and therefore not in competition with private sector technology development. Require that the principle investigator make the primary procurement decisions free from Federal Acquisition Regulations. Minimize abuses and avoid multiyear authorization by keeping grants relatively small. As commercial companies establish space operations, support their property rights. Comprehensive legislative language drafted for discussion by Dr. Andrew Cutler details many of the Coalition's ideas on procurement, property rights and transitional policies. This legislative language is available on request. Fly lots of scientific missions using commercial services. Base them on fresh ideas. Let unfashionable ideas find funding. Decentralize procurement decisions. Avoid competition with the private sector by focusing on research rather than development. Enforce new property rights in space as they are defined. Give Americans a challenge and trust them to react with the resourcefulness and courage of our ancestors who risked everything to cross the oceans to settle a hostile continent. We won't disappoint you. The space frontier is a hostile environment with unlimited potential that demands our best. We can meet such a challenge only with the strength of our traditional American values -- values uniquely adapted to opening frontiers. This Subcommittee is in a position of great privilege. The next millennium could witness the restoration of Earth's environment and the transformation of space into an new kind of ecological range, virtually limitless in its extent and diversity. Those creating the incentives that open the space frontier now will be responsible for the fulfillment of this vision which appears to be the ultimate destiny of Western Civilization's progressive tradition. The author grants permission to copy without modification. in 1986 I had been avoiding joining the L5 Society because, like the stories NASA told about the space shuttle to get it funded, it seemed populated with too much fiction and too little scientific realism. Here, however, was reality -- blessed and cursed reality -- setting in. The science fiction fans scattered like hypersonic debris from the L5 Society, along with dreams that NASA might yet have the right stuff. That's when I took over the emptied San Diego chapter of the L5 Society and appointed myself its President. This was far from one of those times a demagogue saw a crowd moving in a particular direction, ran out in front of it and declared himself its leader. There was a serious problem at NASA and its aerospace contractors. My proposal to the NSS's first President was to make a Presidential Award for Ethics and Integrity to the four Morton Thiokol engineers who had to be excluded from the meeting during which the fateful decision to launch the space shuttle Challenger was made -- primarily because they would not back down from their "no-go" recommendations despite pressure from NASA to launch, apparently in time for President Ronald Reagan's State of the Union address to the US Congress. I offered to do all the leg work, paying a trophy shop to make four engraved wall plaques, one for each of Roger Boisjoly, Robert Ebeling, Alan McDonald and Arnie Thompson -- and to work with Morton Thiokol public relations to allow an official acceptance from their engineers. Bova accepted the proposal and at the National Space Society's first national meeting in Pittsburgh, Ben Bova allowed me to present the plaques to Arnie Thompson, Supervisor Structures Design who accepted on behalf of all four engineers. It was to be the first of many awards to those men for their engineering ethics under enormous professional pressure to buckle. 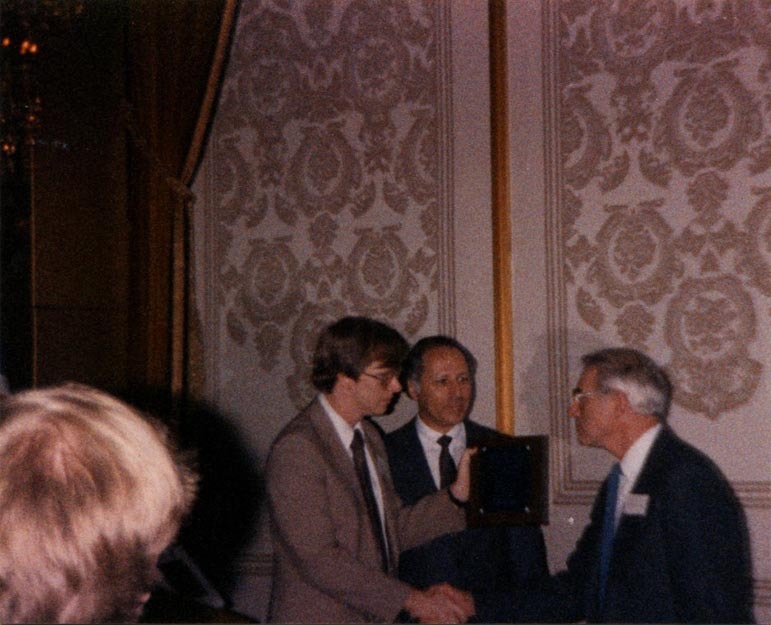 Jim Bowery, at the first national meeting of the National Space Society, presenting the National Space Society's Presidential Award for Ethics and Integrity to Arnie Thompson who accepts on behalf of Morton Thiokol engineers, Roger Boisjoly, Robert Ebeling, Alan McDonald and himself. Ben Bova, President of NSS, looks on. Below is the not-so-famous interoffice memo describing the O-ring seal problem well in advance of Richard Feynman's famous analysis of the cause of the Challenger explosion. measues should be taken to reduce flight risks. Section 1. Whenever two thirds of the State Legislatures shall have acted to propose the same Amendment to this Constitution, it shall be valid for all Intents and Purposes, as Part of this Constitution, when ratified as described in Article V.
Section 2. A State's act to propose or ratify an Amendment is invalid after two years if not renewed in a similar act.